Or, version 2.0 of chocolate chip cookies. Over the years, I’ve found version 1.0 a bit too flat (in texture), a bit too hard-chewy, and even a bit too bitter. I’ve found a better source of chocolate chips (Guittard’s baking wafers), and a great resource for hacking the recipe. My tastes are not the same as J. Kenji Lopez-Alt’s, but his recipe and guidelines are very informative and helpful. The biggest differences are that I use a lot less salt, whole wheat pastry flour instead of all purpose, vanilla sugar instead of extract, and am generous with orange flavorings. 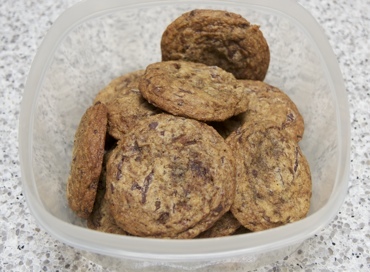 Update (26 February 2014): Yep, frozen cookies bake up just fine! 4 1/2 ounces semisweet or bittersweet chocolate chunks; I like Guittard’s 61% cocoa semisweet cooking wafers, but if you prefer less sweetness, their 72% bittersweet cocoa wafers are also good. Brown the butter in a sauce pan. I do this over medium to medium-low heat, until the milk proteins start turning orange-red (like paprika) in color. Remove from heat, and stir in the Grand Marnier, and allow to cool while you do the next two steps. Sift the flour and baking soda through a strainer into a medium bowl. Grind or mash (via food processor or a handy rolling pin) the brown sugar so that there aren’t any lumps; stir this into the flour bowl. Set aside. Break up the chocolate into roughly 1/2 to 1/4-inch pieces; it’s okay if there are some larger and smaller pieces. I put the wafers in a zip back and gently smash them with a rolling pin. Set aside. Returning to the melted butter: Stir in the orange zest—which I grate right over the sauce pan—and the juice. Set aside, again. In a stand mixer with a whisk attachment, beat the sugar, vanilla sugar, salt, and egg until pale and thick (densely foamy)—about 3 to 5 minutes on high speed. Lower the speed of the mixer, and slowly add the butter-orange mixture. Increase the speed to medium and mix until incorporated. Don’t worry if the mixture looks somewhat curdled or like a lumpy frosting. Replace the whisk with a paddle attachment. Add the chocolate and mix for 10 to 20 seconds on low speed. Pour in all of the flour-brown sugar, and mix until just barely incorporated, on low to medium-low speed, for about 10 to 20 seconds. The resulting dough shouldn’t be smooth, but instead kind of rough-spiky looking, with specks of undissolved brown sugar; see the photo below. If it seems really dry and floury, add a bit more orange juice; if it seems too wet and sticky, add a bit more flour. Store the dough in a medium bowl (I reuse the flour bowl), covered, in the refrigerator, at least over night. This helps in developing good flavor and texture, so try not to skip this step. Preheat the oven to 325ºF degrees (mine is set to “convection baking,” so if you don’t use convection, you might need to raise the temperature by 25º). Line a baking pan with a silicone mat or parchment paper. Using a scoop and/or spoons, place dough blobs of about 2 tablespoons in size on the line pan. I can fit about 12 cookies on a full-sized 16-inch by 11-inch jelly roll pan. Place pan in oven, reduce the temperature to 300ºF (or 325ºF in a non-convection oven), and bake until the edges start to brown—about 12 to 18 minutes—more time if the dough was frozen, about 4 to 7 minutes more. Cool on pan for about 5 to 10 minutes before moving to a rack. 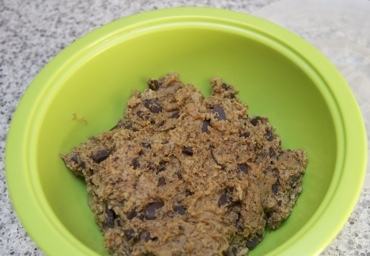 Repeat for remaining dough, after the pan has cooled to the touch&dash;this batch makes about 20 to 24 cookies. You could eat the cookies while warm—I do love melty choco!—but both the texture and flavor are much better several hours later, if not the day after. They have a much less greasy feel, and the orange flavor is more pronounced the next day. The small, non-chocolate brown specks are undissolved dark brown sugar bits, and the overall texture is kind of spiky, not smooth. Good features for a soft, tender cookie texture! This was written by sairuh. Posted on Friday, February 7, 2014, at 12:00 pm. Filed under Food. Tagged chocolate, cookies, oranges, recipe. Bookmark the permalink. Follow comments here with the RSS feed. Post a comment or leave a trackback.